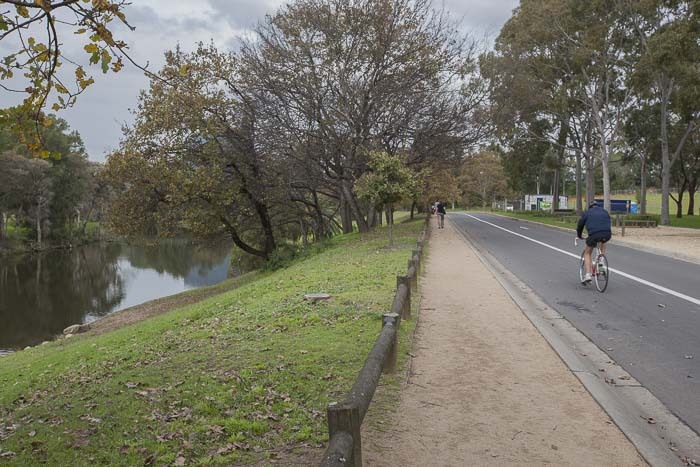 The tranquil oasis of Parramatta Park has several kilometres of roadway running through it, all on a one-way system and with a dedicated pedestrian lane, and also a cycling lane. 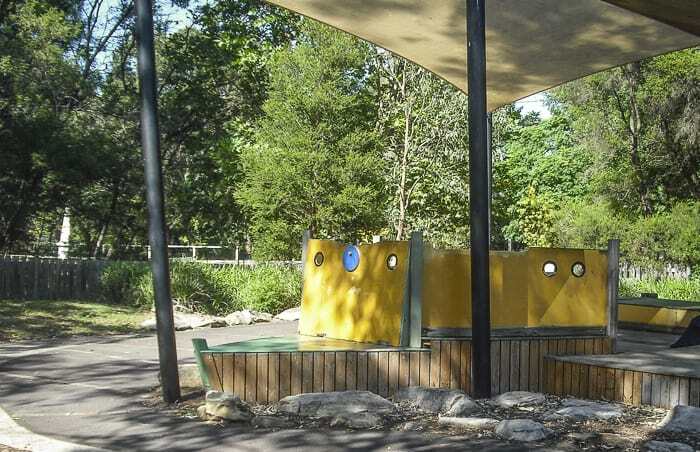 There’s masses to explore within the 85 hectares of the park, including excellent playground. But here we focus on the walk. Some areas have no shade so don’t forget a hat. Time to walk: 30 – 60 minutes, depending on how often you stop! Start: The Gatehouse Tearooms which are inside the park, just on the corner of Pitt Street and Macquarie Street. Toilets: There are several toilets around the park, check details on map. Parking: There is a large car park to the left of the entrance on Pitt Street. There is a two hour time limit Monday–Friday, three hours at the weekend. From the Gatehouse follow the walkway and road as they veer left, this part of the road is called Railway Parade. To the right are the graceful old buildings of Old Government House. This is well worth a visit on another day. On the right you’ll see the area known as the cattle Paddocks and you will cross Domain Creek. Then the road veers to the right, now named West Domain Avenue. After a few minutes of walking, you will see parents and children streaming across the grass to visit the most excellent Domain Creek playground. 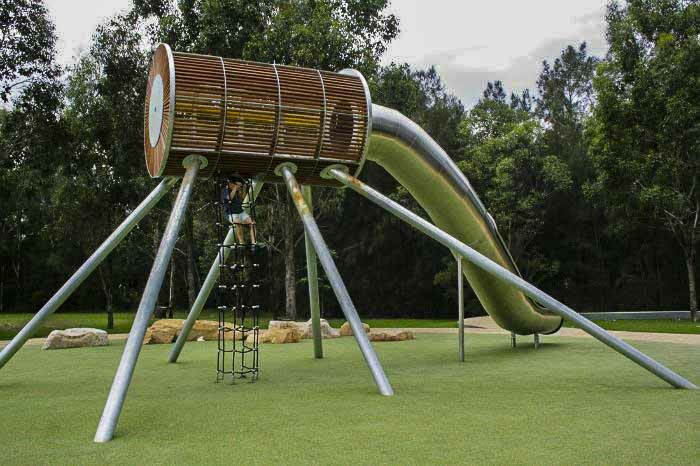 This is a really adventurous playground, read all about Domain Creek playground here. There’s fab play equipment at Domain Creek playground. 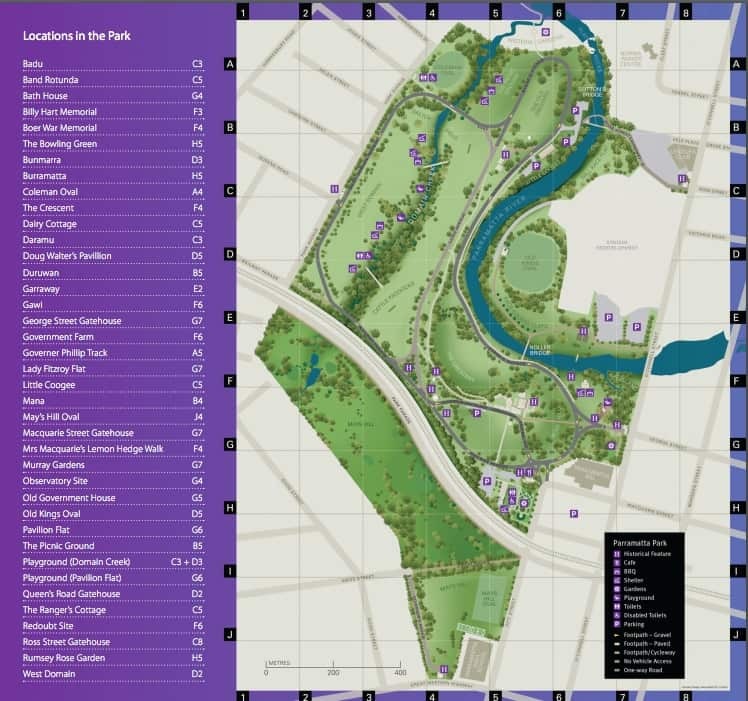 Continue along the walkway as you pass Salter Field on the right, and cross Domain Creek again. You an then chose to take the turn on the right to go along Long Avenue or continue left as the road turns into Byrne’s Avenue. 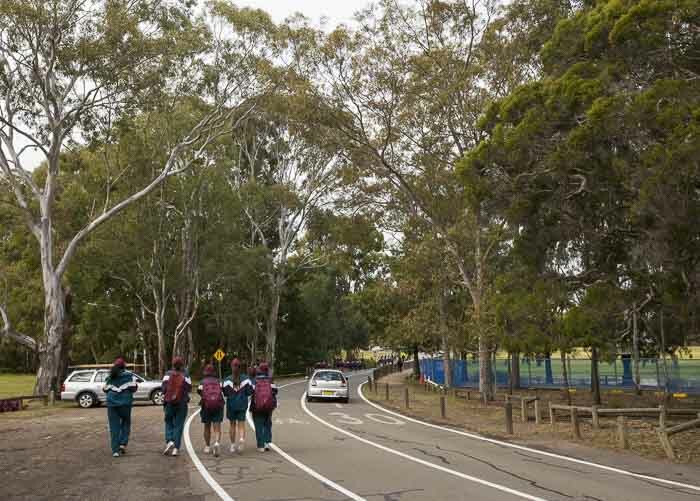 The road and walkway soon start to follow the lush banks of the Parramatta River as it glides its way through the park. Across the river the lights of Parramatta Stadium, home of the Parramatta Eels can be seen. Both a bridge and a causeway cross the river here, there are no steps on the bridge. On the other side the deep, lush grass and shade provide nice spots to sit and watch the muddy-brown water of the river ease by, though manoeuvring a stroller through the grass can be difficult. 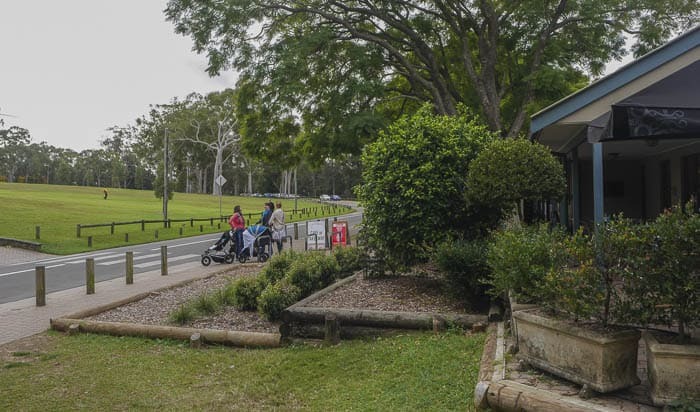 Currently Parramatta Park cafe is closed after a devastating fire. Enjoy the river views as you walk along, passing Noller Bridge as you near the playgrounds near the Tudor Gatehouse. The path sweeps around to the right soon after this to bring you back to the gatehouse Tearoom.